In the morning we departed our cool hotel-by-the-beach at Ft. Lauderdale and that night, after the fair, we'll head to my cousin's fortress house in Little Havana, where we'll stay for the next couple of days. 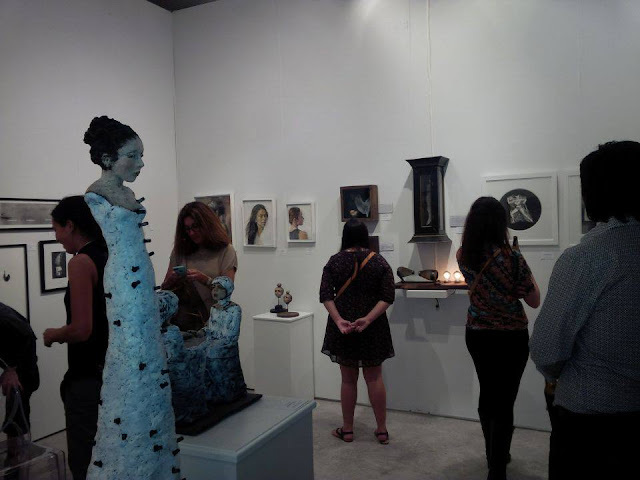 As soon as we got to Context, yesterday's vibe continued today as the crowds (and the rain) continued to come and fall to Context Art Miami. There seemed to be good sales all around, and there was definitely a continuation of yesterday's art-buying crowd. Multiple sales of my work, plus a "come backer" disappointed to find that the piece he wanted was sold - so he ordered a commission. Also first sale of a wondrous Simon Monk piece as well as multiple sales by Elissa Farrow-Savos. Elissa also got attention from a press art critic, and we expect to see her mentioned when the review comes out. The reports from DMV visitors and others about the other fairs also began to pour in - some not so good, but good reports about Scope, Miami Projects and others. By the end of Saturday, a cursory look at the "numbers" showed that we were having the best fair (from a financial perspective) ever! We closed at eight and headed to Little Havana - less than four miles away - on the way we ran into a monster traffic jam in from of the Marlins' Stadium (there was a concert)... we actually stood at a red light on 7th and 17th for 20 minutes before the cops changed it to green. Once at my cousin's house, his wife had dinner ready for us; a couple of wine glasses later, I punched out.